In opposition to recent proposed Mississippi legislation that would permit off-shore drilling on the Gulf Coast, the Green Party of Mississippi is proud to show its opposition to the destruction of 225,000 acres of water bottoms of the Mississippi Sound for oil and gas exploration. The proposed drilling legislation would transfer control of the permitting process from the Department of Environmental Quality to the Mississippi Development Authority. Governor Haley Barbour, a former oil industry lobbyist, received over $300,000 from gas and sources during his campaign for governor. Drilling would destroy wildlife, degrade the barrier islands, and ruin the tourism industry on the Gulf Coast. If the barrier islands are damaged, the protection that they provide during hurricanes would be diminished and loss of human life is the likely result. The Green Party of Mississippi supports the efforts of Gulf Islands Conservancy and the Sierra Club of Mississippi to prevent drilling and to preserve our natural treasures. 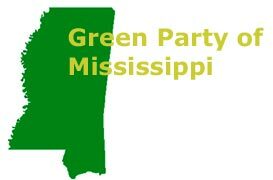 “We need to do all we can to protect the Mississippi Gulf Coast environmentally, and to avoid further challenges to safety and a flourishing economy,” said Michael J. Dixon of Ocean Springs, District 4 member of the Green Party of Mississippi Executive Committee.